like a fashion blogger talking about dish soap!" Y'all, quick side note: a couple of people mentioned the dish soap example, so I am so curious as to who it was! But the fact that it was brought up more than once proves how jarring the topic of a sponsored post can be. "Every post should be sponsored." "You can turn ANYTHING into a sponsored post." "Go after every offered opportunity. Make it fit to your blog." What do you think about those statements? Those ideas really turn me off as a reader. The second and third statements really depend on the type of blog you have. I'm a beauty+lifestyle blogger, but I'm don't feel right doing a post on the best caulk for your bathroom. It doesn't fit my niche, but it might fit yours. I've been approached for posts on s-x toys (I'm not spelling it out to avoid spam! ), boats (I wouldn't get a chance to try the boat or receive one, but they wanted me to write on it??? ), and all sorts of not-my-niche topics. I've turned down lots of stuff, and one of my friends thinks I'm ridiculous for doing so. I just can't do it. Remember how I said last week too many sponsored posts sound like a commercial? Sometimes when they are out of niche, it can sound that way too. I remember this mommy blogger who was VERY vocal against smoking. And then one day I see a sponsored post on her blog for cigars. Part of me distrusted her after that. But part of me wondered if she had a reason. I hope she had a reason. I talked about this yesterday, but when I found out my dad had cancer, I immediately started accepting lots of sponsored posts, in hopes to help pay for my gas to see him/time off from work/etc. I never accepted anything too crazy, but I know I accepted a few more lifestyle posts that I normally do. 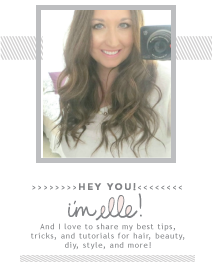 There aren't nearly as many opportunities for beauty bloggers like, mommy or lifestyle bloggers get, for example. But it was never anything that made me feel uncomfortable, and nothing that I didn't use and enjoy myself. At the end of the day, it's your blog, your money. But from the unofficial research I found, blog readers dislike it when the sponsored post doesn't fit the genre. It can give a sense of lack of credibility to the writer. Does the blogger really like this product or are they just saying that to make money? Authenticity is the key, I think. I know I've said this before, but I love this series, Elle! I totally agree, it's your blog and you can do what you want with it, but I can also see from a reader's perspective wondering if you actually like the product or do you like it because your are getting paid for it. I think it's so important to be genuine with your readers. Great post! Great post. I am curious about the dish soap poster now, too! I think I said before I don't mind sponsored posts but as a reader I like when they are relevant to that blogger! I am not a fan of many sponsored posts and myself only excepted things I would ever actually use in real life. I think to many sponsored posts makes the voice inauthentic and makes you distrust their opinion. I believe that if it is a product that you honestly believe in, it deserves a place on our blog. We are fashion bloggers, but we talk about random stuff in our lives all the time, sponsored or not. Just the other day I was raving about the Amazon Echo. Totally random! As long as you remain authentic, than you really can't go wrong. I've always heard the advice that you should only accept sponsored posts that match the personality of the blogger themselves. I've received lots of offers from random companies, but if I personally wouldn't buy it or feel good in recommending others to buy it, I don't think it's a good fit. I can understand going for sponsored posts regardless of the niche if that's your sole income and money is tight, but I think just in general it's a good rule of thumb to stick to what you know/like. I've really been loving this series, Elle! ok that cigar mom blogger story is SUPER weird haha. i mean especially if she always touted not being a fan of smoking. like what do you believe at that point? anyway happy bday to your mom! I'm really enjoying this series! I think that the key is to stay with the genre of your blog and writing about products you are genuinely interested in. Every blogger can make this decision for herself, but I'm from the Sixties when "selling out" was frowned upon. In my view, people lose a little credibility with me when they accept sponsored posts. I understand that some young women need money but I'd rather they earned it IRL and kept their blog pure. Commercialism contaminates things. I don't think every opportunity can fit your blog. A couple of years ago (or maybe last year) people were doing sponsored posts about toilet paper in exchange for access to the Kentucky Derby. Remember that? Ugh... no. I agree with you, there is a time and a place for sponsored posts. I would stop reading a blog if all posts were sponsored. Happy Birthday to your mom! I think as long as it fits in with your lifestyle, I agree it's ok! Turning down sponsored posts can be hard, but I think to keep true authenticity is worth it in the long run! This post is so spot on and I couldn't agree more. I don't mind sponsored posts as long as they fit in with the subject of the blog. Every post should be a sponsored post?! Whoever that was, he/she shouldn't be dishing out advice. It's the reason why some people call us bloggers as a 'sell-out'. That we say anything and everything nice for a few bucks and free samples. Happy birthday to your mama, Elle! Hope she has a brilliant celebration! I'm totally loving this series. I feel like if the sponsor fits your blog then go for it. Also I can't stand when all the blog post are sponsor. I'm not going to lie. I have stopped reading a for blog do to that. This might be my favorite post you've done so far in this series! I don't think anyone should try to make something fit into their blog if it just doesn't. That makes it seem staged, and I agree that if I saw someone posting about dish soap id be so confused lol! YES I agree. I think it's crazy what they tell you at the seminars... I feel like you have to like blogging to start, and I get wanting to make money once you're established but if all it's for is to make money after a certain point, that doesn't seem right. I've gotten an offer for glasses (don't wear them), a weighted blanket website (first of all, I wasn't going to get a blanket, second of all, weighted blankets are mostly meant for people with autism--if I had an autistic child, sure, but I don't), and cleaning products. I don't even know how to blog about cleaning. And it totally doesn't fit my blog at all. Also I get countless 'offers' of people being like, "LOOK YOU CAN BLOG ABOUT THIS--I'M GIVING YOU A FREE TOPIC, IT'S A GIFT!" but I wouldn't get anything from it...like, no. I'll come up with my own topics, thanks. I have two blogs in mind that I think do the worst sponsored posts. Actually, one of them I only saw one that was bad, but the other seems to post every opportunity but they don't fit. Completely agree with you. A sponsored post should make sense with your "brand". If I get an opportunity to write about tax products (yes, I was just contacted about that) I turn it down because that wouldn't seem genuine! Something that I've heard is "would you write about this if you weren't getting paid?" then you know it's genuine. It is definitely difficult to balance sponsored posts. I feel like I go 2 months without seeing a single opportunity that would fit well with my blog and then BAM! Everything all at once. I really try to space them out, but it gets hard when everything that I feel like could work with my blog would all have to go up within a 2-3 week time period. I've turned some down before because while I love sponsored posts I want my blog to remain organic! I don't want it to be sponsored post after sponsored post. Someone asked me once to write a sponsored post about tampons. I mean, yes of course we all use them but that has nothing to do with my blog haha! I don't mind sponsored posts as long as they are organic and natural. I especially hate seeing them on YouTube. Every time I see forced sponsored videos, I'm like, "Are you serious? This is like a full-on 30-minute commercial!" You couldn't have said it better, Elle! I am slowly trying to transition my blog to more of a beauty, fashion, and lifestyle blog...I noticed that sticking to just beauty was making it difficult and you are right, there are more opportunities for lifestyle blogs. I think as long as you truly like the product and it fits with your niche, it shouldn't be a problem or sound too commercial-esque. I have done a dog friendly areas post on my blog, just recently, it was to bring awareness to a company and dog friendly spots. Although I did it for a company, I didn't get paid for it...yes totally outside of what I normally post, but I love my Charlie! PS - Have I mentioned how much I love this series? Well, I do! LOL! Also, I tried switching from a No Reply blogger...did it work? I agree with alot of these points, however, if you can somehow tie a post in with your life or find it relevant to your readers, I think it is ok. Since my blog is about beauty and fashion, no cars or power tools isn't necessarily going to fit in. However, if you happen to really believe in a product and don't mind if it is a bit off topic, I think it is ok to talk about it. For example, I used to post super easy recipes that I have tried and really worked for me. Even though I don't have a cooking blog, I thought that some of my readers my like to know a bout a super easy recipe that I found and loved. Does that make sense? Statements 1 and 3 turn me off as well, but I do believe that you can turn any post into a sponsored post, but it doesn't mean that you should. i don't remember a dish soap but i do remember several people posting about laundry soap for awhile, so that was pretty funny. and what you said about the girl with the smoking/posting about cigars.. distrust is hitting the nail on the head. it just makes your 'readers' not believe or trust you. I definitely agree with this. In general I don't mind sponsored blog posts, but this is definitely what bothers me about them on some blogs. 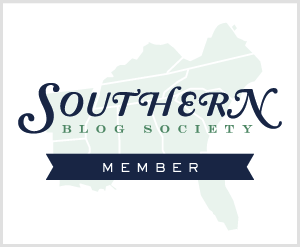 If it doesn't fit the niche of the blog at all, I find myself assuming that they are doing it just to make $$. Which isn't wrong. But I also am not going to trust their recommendation or look into the product. I 100% agree with you about having sponsorships that don't fit your niche. It would make me really wonder if you were doing something just for money if you all of a sudden started posting about home improvement things, unless I knew that you were working on your house. Yes, I totally agree with this--if it doesn't seem to fit into the niche or target audience, it comes across as inauthentic. I have also turned down brands that don't fit my niche or things I wouldn't use/buy myself. I think the important thing is just being open and honest with your readers! I don't believe in those statements. The content must match your voice and style. I've been offered products that would not suit my blog or me personally and have to decline. Doing something like a dish soap post can really throw off your readers and make them question how genuine your word is. I couldn't have every post as sponsored. But that's just me. I do know some bloggers have nearly ALL sponsored posts, yet they make it into a great story to read. But I agree, it should match your content, otherwise people might be all ??? I think as long as you are a credible blogger some sponsored posts are okay, but I don't like it when I see so many of them on bloggers sites. If they aren't trying to make it their own, then that's when it's annoying. Every post being sponsored is too much. It should always fit in your niche and you should never lose your voice. This is such an interesting series and topic to share about. I have nothing against people who want to make money from their blogs, all power to them. My blog is just a hobby so I'm not focused on making money from it. Sponsorships are nice, but not the whole reason I blog. When I first started I'd get excited and say yes to anything that came my way. it came back to bite me badly when someone asked if I could help arrange a refund with a company I'd worked with, as they had bought something as I had 'endorsed' the company, it had arrived broken, and the company was refusing to respond to them about it. I felt terrible, and I say No to a lot more now. Now, I'm really curious about the dish soap post! The last few months I've been looking at sponsored posts for my blog, but so many of them are mommy focused. I think it can been be tempting to do a sponsored post outside of your niche, but it doesn't usually work. Dish soap sounds like the most boring thing to blog about ever, BUT I guess if you are a cooking blogger and you want to talk about cleaning dishes easily... then, go for it! lol! Love this series! You said it - it's your blog so do what you want! Happy birthday to your Mom! The OG Barbie. (; I can't believe some of those seminars you attended really said every post should be sponsored and to make any sponsor work for you. Like, what? No no no. All of that would make me stop following a blog. It's just too much and too over done. I used to be one of those people who fell for the "go after every opportunity" sentiment, but it just left me feeling as if my blog weren't as authentic as I intended it to be. 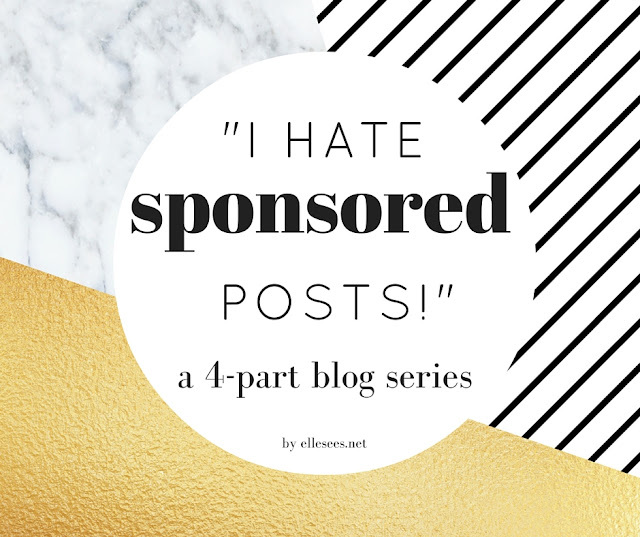 Yes, some sponsored posts do fit the tone of your blog, but others don't - and you can't force it. Happy birthday to your mom, Elle. Once again great insight here. I have been so behind blog reading and I have to read part two but I loved reading this. I have always wondered about webinars and blog conferences. I will be back catching up tomorrow. Really enjoyed this post, I think that a sponsored post should be very informed as soon as you check some blog and also, it must be something that fits on the blog theme! It's gotta be a good fit, so true. If the product makes sense with your brand + aesthetic, cool, go for it. But blogging about something that doesn't even come close to fitting seems like a straight up money-grab. And wtf is with that mommy blogger who blogged about cigars? C'mon, now. We see right through stuff like that- and your readers will, too. You don't want to lose the trust of your audience- it's so hard to get it back! Great idea for a post series! Truly. I think like most people, I don't mind sponsored posts peppered in (and understand why they're there! ), I would hope no more than like 4-6 a month (assuming someone posts regularly). But again, who am I to judge? I will say though when someone goes overboard and posts a sponsored post more than regular posts, they will have people start to lose interest. finally, an honest post! gotta admit i enjoyed being sponsored every now and then (i mean who wouldn't right). but i should also admit that i was focusing too much on sponsored posts that i kind of departed from the genuineness of my blogging. i decided that i needed to "detox", which i'm currently doing, and it made me feel a lot happier with blogging life than ever. no judgment to those who still enjoy doing sponsored posts though, again, they can be really addictive! I agree. When a sponsored post is so out of niche it becomes even more obvious. I would love to know which fashion blog was talking about dish soap just to go see how they tried to make that one work. That's interesting! I feel like its your blog and you do what you want with it...but when I see a blogger posting about adult diapers or caulk for walls I have to think...really???? I dont mind a sponsored post if it is something that the blogger is using or thinks the readers would really enjoy but there are also lines to draw. I have turned down a lot of offers, I've gotten some pretty strange ones too! I'm all for sponsored posts, but I try not to do too many in a short period of time and it always has to fit with the concept of my blog. I do agree with you, something that is out of the niche your blog is can be a little off putting. As a beauty blogger myself, I know I would never talk about something way out of that zone. I am starting to lean my blog towards the occasional lifestyle post, but with still mostly beauty, so if an opportunity comes up, and it involves a product I already use in my life, I won't turn it down. That's just me though!